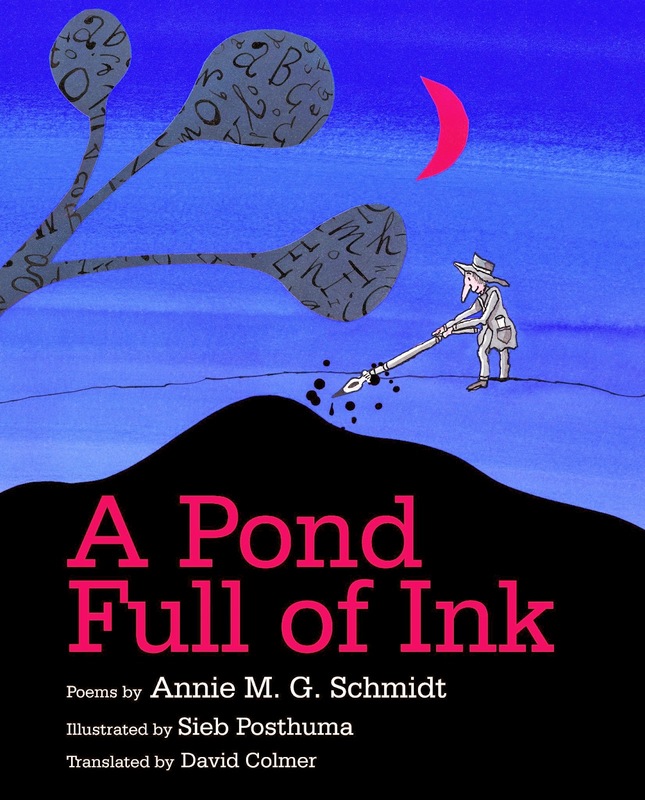 Recently, I received a copy of A POND FULL OF INK, a collection of nonsense poems written by Annie M. G. Schmidt, translated by David Colmer, and illustrated by Sieb Posthuma. It's a mystery to me how rhyme originally written in one language can be translated into another, but I'm glad that it was. I can’t judge how close Colmer’s choice of words are to Schmidt’s Dutch. I only know that the combination of text and pictures works beautifully here. Both the poems and the artwork (done in collage, ink and watercolor) have a goofy freewheeling feel. Posthuma’s illustrations (copyright 2011) have a slightly psychedelic 1970s spirit which make them perfect for the poems (originally copyrighted in 1978). The poem “Aunt Sue and Uncle Steve” describes a family living in a “big old oak.” It’s not until you turn the page that you see the tree in its entirety. It has a face and numerous tiny children playing in its branches. Uncle Steve smokes his pipe in one branch and Aunt Sue rocks a baby carriage precariously harnessed from another branch. (“She’s never really worked out how / to park a stroller on a bough.”) A boy rides a swing dangling from pulleys, and ladders are propped to connect the different levels of the home. Crazy, funny details—perfect. 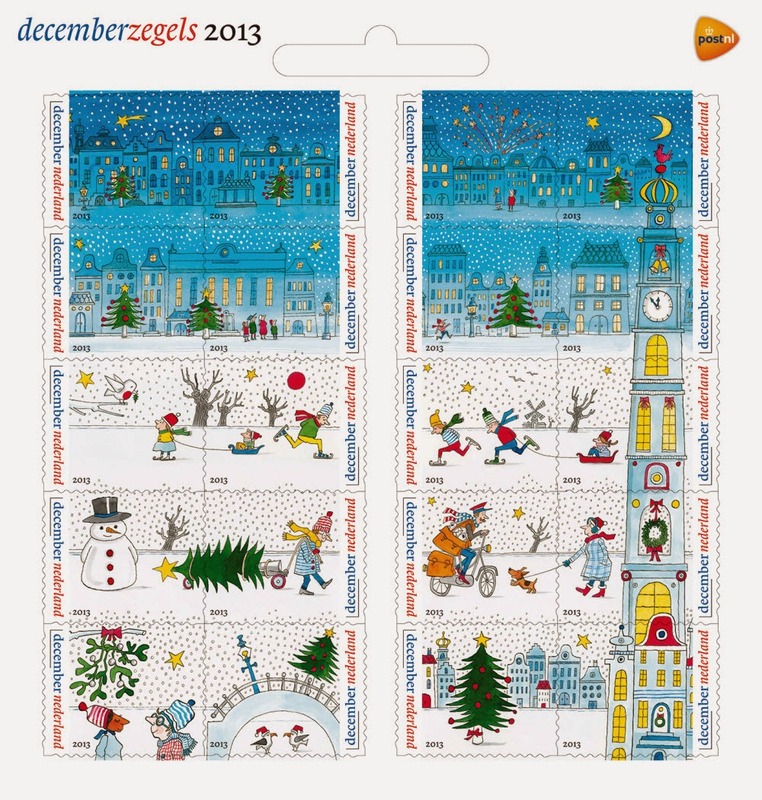 Trim Size, in inches: 8.25"x10.375"
Sieb Posthuma was also commissioned to design stamps. "For Sieb, the challenge lay in creating one credible, all-inclusive illustration that could be divided into twenty separate stamps. The snowflakes and the clock tower on the right were used to link all scenes together."